Secretary of Homeland Security Janet Napolitano, U.S. Customs and Border Protection Acting Commissioner David Aguilar and Department of Homeland Security Assistant Secretary for International Affairs Alan Bersin today traveled to San Salvador, El Salvador and San Jose, Costa Rica to meet with their international counterparts, hear about their priorities and discuss the U.S. Government's work to facilitate legitimate trade and travel, enhance information sharing efforts and ensure a safe, secure and resilient global supply chain. In a groundbreaking decision, a federal immigration judge has ruled that the former defense minister of El Salvador can be deported from the U.S. for his role in killings and human rights abuses during the 1980s. The ruling by the Orlando-based judge, James K. Grim, marks the first time a 2004 law aimed at stopping human rights abusers from taking refuge in the U.S. has been successfully used against a nation’s top military official, according to the San Francisco-based Center for Justice & Accountability. ContraPunto has a summary of recent polls leading up to the March 11 elections. One thing the polls are showing -- the race for mayor of San Salvador is not even close. Current mayor from the ARENA party Norman Quijano is trouncing Jorge Schafik Handal in the preferences of the city's voters. Handal is the son of one of the founders of the FMLN, Schafik Handal, who ran for president of El Salvador in 2004 and lost. Depending on the poll, Quijano's minimum lead is 25% and some of the polls have him leading by 50-60 points. The most recent poll from CID-Galup/Diario La Pagina shows 34% of voters planning to vote on March 11 for FMLN candidates for National Assembly deputy, 32% for ARENA candidates, and 16% for other parties. Almost one in five Salvadorans polled were undecided. The poll of 1008 eligible voters was taken between February 16 and 19 . These results are typical of the results almost every time Salvadoran are polled about their political preferences. One third of the voters show allegiance to ARENA on the right and one third to the FMLN on the left and everyone else is somewhere in between. I have yet to see any polling looking at voter preferences for individual deputies on the slate of any party. With their right fists clenched and thrust into the air, leading politicians of ARENA commemorated Major Roberto D'Aubuisson on the 19th anniversary of his death Tuesday. Among those at the ceremony at D'Aubuisson's tomb were former president Alfredo Cristiani and current San Salvador Mayor Norman Quijano. D'Aubuisson is the founder of the ARENA party. He is also the man who ordered the assassination of archbishop Oscar Romero and was the sponsor of right wing death squads during the 1970s and 80s. This annual celebration of a war criminal by the ARENA party faithful shows that the culture of impunity is far from disappearing in El Salvador. It's shameful. The Facebook page called "Sociedad Civil" (Civil Society) is sharing a photo album of the worst examples of campaigning during this campaign season leading up to the March elections. You'll need to be able to read Spanish to understand some of the comments, but some photos, like the one above, speak for themselves. 2 February 2012 – A United Nations expert human rights panel has voiced concern about the right to security impinging on the right to be free from arbitrary detention in El Salvador, as well as extreme overcrowding in prisons and police facilities in the Central American nation. Wrapping up a 10-day mission to the country, the five-member UN Working Group on Arbitrary Detention also highlighted the lack of written notification of sentences to the defendant and the lack of effective access to defence counsel. Another concern was the “over-reliance on informers and testimony by opportunistic witnesses,” the Group said in a news release issued in the capital, San Salvador. 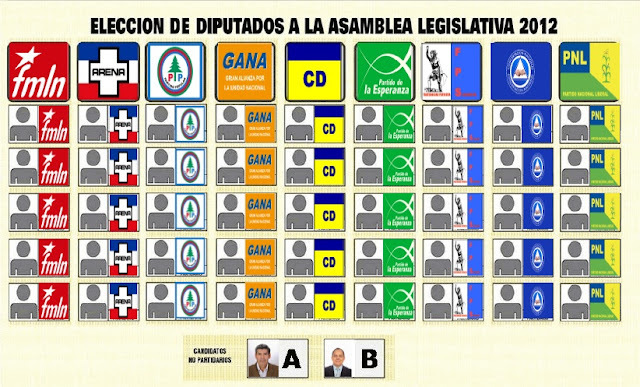 In my last post I described the changed rules for electing deputies to the National Assembly. Another change for the 2012 elections will be a significant expansion of residential voting. Residential voting simply refers to having polling places which are closer to where people actually live. Currently people are assigned to polling places which may or may not be the closest site to their home. El Salvador has national elections approaching on March 11. 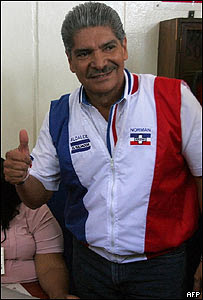 Salvadorans will be going to the polls to elect mayors and to elect deputies to the National Assembly. The rules have changed this year as a result of decisions by the Salvadoran constitutional court. For the first time, independent candidates can run for election to the National Assembly. Also for the first time, voters can express their preferences for individual candidates from the slate assembled by a particular party. Here's a review of the changed process. Each department within the country is allocated a certain number of seats in the 84 seat National Assembly according to its population. So, for example, the populous San Salvador department has 25 deputies and the less populous San Miguel department has 6 deputies.